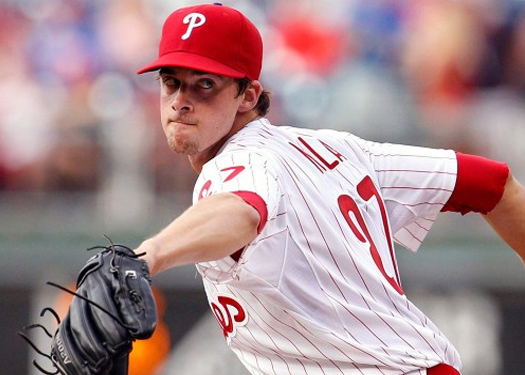 PHILADELPHIA - Aaron Nola shined for three innings on Friday night at Citizens Bank Park in his final spring tune-up before Monday's season opener. A rain delay of nearly an hour cut his start short, but of the 13 batters he faced he struck out five and surrendered one run - though it was unearned. "Of course I wanted to go a little longer," Nola said. "It was definitely good to get back on this field again and get back again." Nola entered Friday's contest having surrendered nine runs over 15 1/3 innings this spring. His command was an issue early in the spring, but he had everything working on Friday. "All my pitches felt good," Nola said. "I felt good and felt like I was commanding my fastball. I started working my curve ball in there near the third inning, too." The right-hander is scheduled to make his first start of the regular season on Wednesday in Cincinnati and is slatted to start the Phillies' home opener against the Padres on April 11.